A boy who was slashed from the left cheek to the ear by the Japanese in 1945. Image credit: United States National Archives. The photograph shows the side of the face of a young boy from the then-town of Lipa which was sliced from the left cheek to the ear by a sharp weapon, probably a knife or a bayonet. Gruesome as the face may look, albeit it has already healed, at least the boy evaded the fate of thousands who died at the hands of the Japanese in Lipa in 1945. 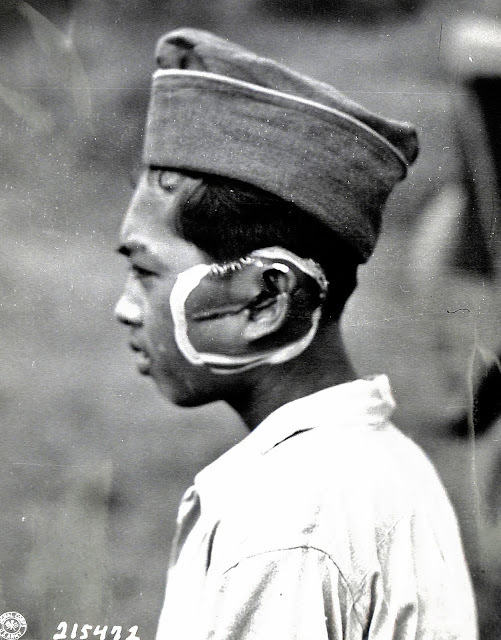 Original Caption: Scar on the face and ear of Juan Castillo, Filipino, is the result of mutilation inflicted by the Japanese. Lipa, Batangas, P.I. (for Philippine Islands).